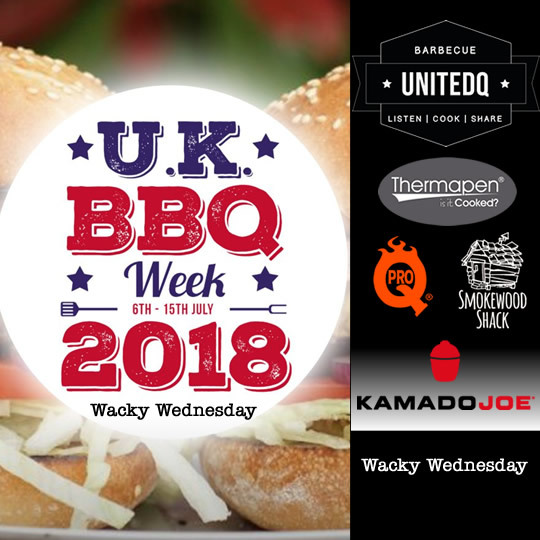 Blog E132 – #UKBBQWEEK Wacky Wednesday!! E132 – #UKBBQWEEK Wacky Wednesday!! ProQ is dedicated to providing you quality smoking products, with top notch service and free advice for beginners to pitmasters. You can find them on Facebook, Twitter and Instagram under ProQSmokers. Kamado Joe is renowned for Build Quality and Innovation, from smoking, roasting or searing, Kamado Joe is the Premium Ceramic Grill, chosen by Michelin star chefs and BBQ enthusiasts alike. Kamado Joe’s patented technology lets you cook with confidence and stay in complete control, get that great BBQ taste and keep the moisture locked in your food. Check out kamadojoe.co.uk plus Facebook and Twitter. Thermapen Instant Read Thermometers – Take the guesswork out of barbecuing with a Superfast Thermapen! Smokewood Shack delivers quality smoking wood every time! They provide the smokey goodness – you provide the talent! So if you are looking for smoking wood chunks, dust, chips or planks then head on over to SmokewoodShack.com.